The Depression years of the early 1930s brought with them the need for a simpler - and cheaper - model to compete with the lightweight two-strokes mopping up the lucrative up-to-200cc market. 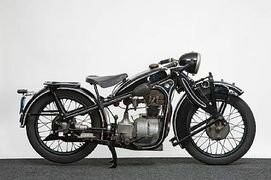 BMW responded with its second single-cylinder design – the 198cc BMW R2 – which appeared early in 1931 and sold well despite the difficult trading conditions, as did the 398cc R4, a favourite with the German Army. R3 (305cc) and R35 (347cc) singles appeared later in the 1930s, all enjoying the benefits of shaft drive like their larger siblings. 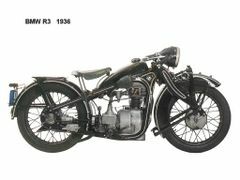 Of these, the R3 is by far the rarest, being produced for the 1936 season only, during which time only 740 were made. Factory records show that this R3 was delivered to Moto-Lusa in Lisbon, Portugal in May 1936. Unrestored, the machine was first registered in the Netherlands in 1986 and was purchased for the Neutkens Collection in 1992. Noteworthy features include a Veigel-D-R-P 'Waltzentacho', quick-release fuel filler cap and a Bosch headlamp with Hella rim. Offered with Netherlands registration papers. This page was last edited on 21 December 2018, at 19:07.